Here you can find all the information for transportation from/to Skiathos but also within the island. All times are local and sorting order is by most regular public services first. Last update on April 07, 2018 22:47 Local. By winter season since 2016 Skiathos market is changed a lot since as destination is no longer part of PSO routes (see details here). 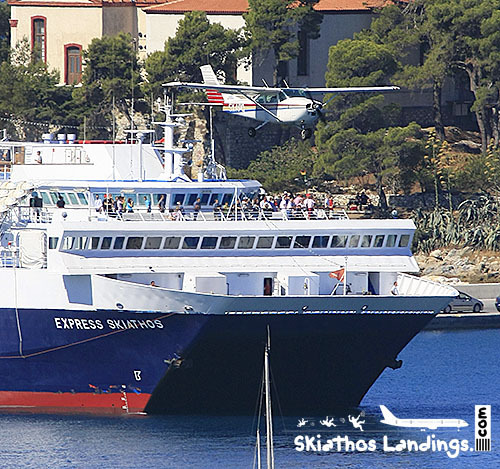 Since the market is open, we have two airlines between Athens and Skiathos for winter, Olympic Air and Sky Express. A domestic traffic growth, seen on 1st quarter 2017 on passenger traffic statistics, as we post on our blog here. In 2017 (annual) we may see more increase on domestic traffic compared with 2016 because of Sky Express higher capacity ATR72-500 flights started by April 2017 as reported here. During summer 2016 three daily flights are extended beyond July and August to June and September. That was probably the best year in terms of frequency of schedule flights. Two carriers will serve domestic flight network at Skiathos. 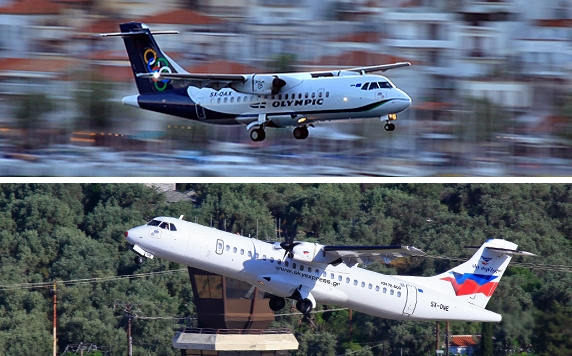 Regular aircraft type for flights between Athens and Skiathos is Dash 8 Q400 for Olympic Air and ATR42/ATR72 for Sky Express. The increase of flights and capacity by Olympic Air seen back in 2015, with many flights operated with Airbus A319/A320, will not something we expect to have this summer (2019). 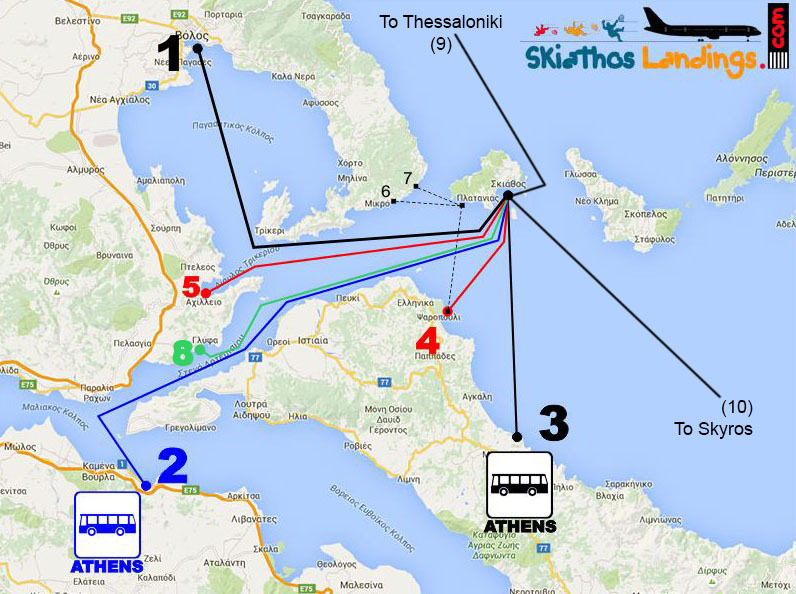 However in 2019 Olympic Air will try once more, after 2011, to connect Skiathos with Thessaloniki (details here). There are several connections by sea between Skiathos and the mainland, but most of them during summer. All those connections are marked on the map below. With black color are the lines operated all year round. With blue the seasonal services, and with red the routes of smaller charter vessels mainly during high season. The two major ports connecting Sporades (Skiathos-Skopelos-Alonisos) with mainland are Volos (No1 on map) and Agios Konstantinos (No2). How ever the active connections all year round are two. The line from/to Volos (No1), served by ferry and flying dolphn and Mantoudi (No3). 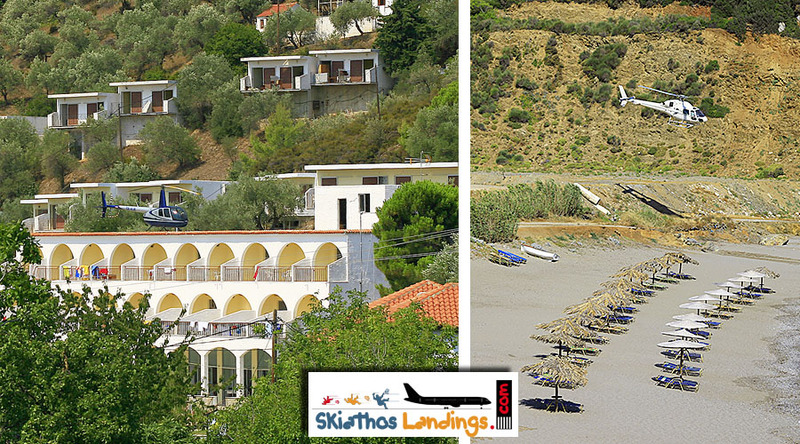 The scheduels between Agios Kontantinos and Sporades are active between early June and mid September every year. On skiathoslandings.com you will find updates for all those schedules every period of the year. On 2016 a new company enter the market with a ferry ship offering services from early May. Subject to weather conditions Water Taxi services is available from Skiathos to several places but mainly there are three popular connecting points providing further access by road. Those places are Vassilika (No4), Platanias (No6) and Katigiorgis (No7). Details on Water Taxi section below. The is also a route between Skiathos and Evia (Mantoudi No3 on map). This route may continue all year round according to the bookings. This particular route offers an excellent connection with bus from the port of Mantoudi directo to Athens Bus Central Station at Liosia. On skiathoslandings.com you will find updates for all those schedules every period of the year. At Skiathos is based a company offering water taxi services all year round, from any plance in Skiathos to Vassilika (Evia No4 on map), Katigiorgis and Platanias (Pilion, No6 and No7 respectively on the map). Base port of the water taxi vessels are in Koukounaries but during summer season they are serving several places on the island as you will find information on section for “Within Island Transportation”. Water Taxi service is provided all year round but operations may effected by weather contitions. For group of more that 4 persons there are Air Taxi operators with 4 up to 19 passengers aircraft capacity offering air taxi services on request, to/from Skiathos. You are welcome to contact us for a quotation. Chartering a helicopter is an expensive but extremely unique solution. According to the Greek legislation a helicopter is allowed to land on every place the pilot feels safe. So this, in terms of customer service, means that a landing spot could be your garden, an isolated beach, an uninhabited island (something like a piece of rock in the middle of know where) etc… There is a variety of helicopters capacity from a single passenger to six passengers. You are welcome to contact us for a quotation. Chartering a light aircraft is the most cheap way to fly on-demand with airplane from/to the island. There is a variety of light aircraft capacity from a single passenger to six passengers. You are welcome to contact us for a quotation.